The Bengals declined to tender Kaaya a contract for 2019, making him an unrestricted free agent, freelance NFL writer Howard Balzer reports. Analysis: Kaaya was claimed off waivers by the Bengals in February, but they apparently weren't keen on tendering him at his original-round level (sixth round). The 24-year-old has yet to take a regular-season snap since entering the professional ranks in 2017. Kaaya was claimed off waivers by the Bengals on Monday, Field Yates of ESPN reports. Analysis: Kaaya was waived by the Colts on Feb. 8 after spending the 2018 season on injured reserve due to an undisclosed injury. The 2017 sixth-round pick has yet to earn a job at the NFL level, but he showed potential during his tenure at the University of Miami. He'll compete with Tom Savage for the No. 3 QB job this offseason. 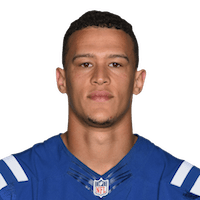 Kaaya (undisclosed) was waived by the Colts on Friday, Mike Chappell of Fox 59 News Indianapolis reports. Analysis: The 2017 sixth-round pick spent the 2018 season on injured reserve with an undisclosed injury, while Jacoby Brissett served as the backup quarterback and Phillip Walker was on and off the practice squad. Kaaya had an impressive college career at the University of Miami, but he hasn't gained any traction in the NFL. He'll hope to find another opportunity to compete for a No. 3 QB job. There are no videos available for Brad Kaaya. Click here to view all videos.